Puyallup, Washington real estate consists of a thriving riverfront city about eight miles southeast of Tacoma. With a population about one fifth that of Tacoma’s, Puyallup WA is comfortably small; yet large enough to offer a full range of services and amenities. Downtown Puyallup real estate is home to a busy commercial district and a mall with dozens of high-profile anchor tenants, and the local school district is Washington’s ninth largest, with more than 30 schools, and 20,000 students. 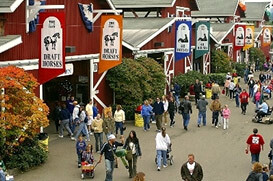 Puyallup WA also hosts Washington State’s largest annual fair, which attracts more than one million people every year. Puyallup home for sale listings are more moderately priced than in other parts of coastal Pierce County real estate – buyers here will enjoy one of Washington State’s largest selections of mid price level Puyallup homes for sale. For a listing in the low 400K range, Puyallup buyers can expect to find a home with five or six bedrooms, up to a quarter acre of property, and amenities like vaulted ceilings and custom kitchens.